RECIPE IDEA: Grilled Scalloped Potatoes. Perfect with Flank Steak in the summer. Hi. It’s Lois, but I’m not cooking today. Don is. He’s our grill master. He’s making us Grilled Scalloped Potatoes, Marinated Flank Steak and Grilled Corn. He’s the best! In the hot summertime, Don does a lot of grilling. It helps keep the house cool if we don’t have to use the stove inside. Plus, the food is so tasty! This recipe is Don’s easy, peasy Grilled Scalloped Potatoes recipe. Cut a large piece of heavy duty aluminum foil. Spread the butter on the foil. Lay the onion slices on the foil. Wash and slice the potatoes in 1/8″ slices. Place the sliced potatoes on top of the onions. Pour the milk into the foil boat, over the potatoes and onions. Fold each side of the foil together and seal the edges by folding the foil over itself, making a sealed package for grilling. Place the package on a medium hot grill (about 350F degrees), with onion side down. Bake the package for about 40 minutes with the onion side down. You want the onions to caramelize. Turn the package over and continue baking for about 20 more minutes, until the potatoes are tender and the juice is bubbly. 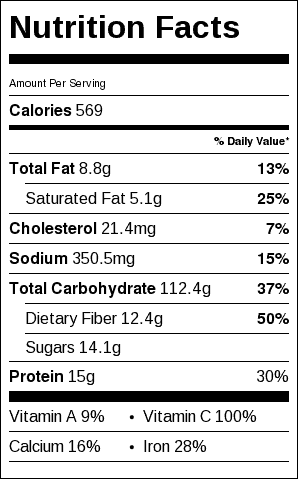 Grilled Scalloped Potatoes Nutrition Label. Each serving is about 1/2 cup.